Oriental rugs are one-of-a-kind, handmade masterpieces that are works of art for your floor. 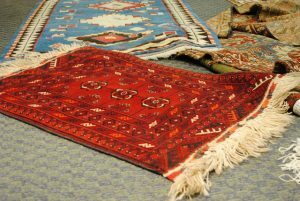 Most people acquire their rugs through one of two ways – they buy their own or they inherit it. If you’ve purchased a new rug, chances are it will stay looking as good as new for many years, even after you’ve handed it down to the next generation. If you inherited one from a family member or from someone’s estate, consider yourself lucky. Older Oriental rugs are like rare treasures – exotic and valuable. One downside to older rugs is that they are more likely to look worn and damaged, especially if they weren’t cared for the way they were supposed to. Another downside could be that you just don’t like the look of the rug you’ve inherited. So what do you do with an old oriental rug that you do not want to keep? There are some steps you can take if you want to sell or get rid of an old Oriental rug. The very first step prior to selling your rug is to take it to a reputed antiques rug dealer and have it appraised. The appraiser will ask if you know the original purchase price and whether you know the exact age of the rug and if there are any interesting historical stories attached to it. They will also look the rug over to determine its condition so as to give you a correct estimate. All rugs will eventually get some worn spots. This is especially true if they have been used in heavy-traffic areas, or if they have sustained water damage, or have been lying under heavy furniture for far too long. An expert craftsman can repair most types of damage without any noticeable signs of repair, but you must be really careful about where you get it repaired. Yes, getting the damage repaired can be expensive, but if you want to sell your rug at the best price, then you need to make any repairs that may be necessary. All rugs should be professionally cleaned at least once a year anyway, regardless of age, but if you want to sell your Oriental rug want to get top dollar for it, then you must get it professionally cleaned. Don’t give it to any rug cleaner. You must look for someone who specializes in cleaning Oriental rugs and natural fibers as these require special care. If you have taken all these steps and are given the unfortunate news that your Oriental rug may be too damaged or fragile to sell as is, you may want to investigate the option of repurposing your rug. One way to do this is by having the best portion of the rug cut out and using it as a wall hanging. Another option is to transform the good areas of the rugs and covert them into throw pillow covers. You could also use smaller cut outs from the rug to make a sort of patchwork rug, thus taking something old and worn and turning it into a completely new family treasure with high heirloom potential. These are excellent options if you have antique rugs that have been in the family for generations, but are too damaged to use in their original form.